Can You Compost Correspondence? | Gardens Alive! Q. Mike: I bought a paper shredder for my office paper, bills, etc., and it occurs to me that the shredding might make a good mulch for my vegetable garden instead of the costly salt hay I use now. It also seems like it might be a good Fall leaf composter placement in midsummer when all we have is green things to put into the pile. However, one of my co-community gardeners thought that the inks used to print the bills might be toxic. I am also thinking of shredding all the tablet paper that I use to write proposals (ball point, pencil and felt tip writing) and paper from my ink jet printer (color and black & white). What do you think? Are any of these things toxic? A. Ah yes, it is the season of many regrets about missed leaf snatching opportunities last Fall. This is why I harp on you poor people all October and most of November to collect and shred every precious Fall leaf you can find! AND to steal all the SPBs (Stoopid People Bags) put out with the trash; those poor unconverted souls may be foolish enough to throw away compost's most essential ingredient and the second best mulch known to man—but don't you be so foolish as to let the Deadliest Garden Sin of Fall—Pride—prevent you from rustling and wrestling the bags into your trunk so those sanctified storehouses of carbon may be freed to pursue their manifest destiny! You're not "trash picking" when you perform this ecologically-correct service! You're the Red Cross of Deciduous Rescue! Think about it—without your blessed intervention, those poor leaves would probably go into a—gasp—landfill, sharing space with lids from old cat food cans and headless Barbie dolls(no—its NOT a pretty picture!) or be torched in an incinerator, their normally pleasant smoke sullied by the less than wholesome smell of a poor unwanted old black and white Gameboy melting away. Forget your needs, Charlie—do it for the leaves! Sorry. Anyway, that IS your long-term solution, and an easier one than you may think,considering your situation. You, Charles, have gone above and beyond our meager request for a name and some pitiful indication of the gardener's location(hemisphere, Greenwich time zone…) and indicated that you toil in a community garden in addition to naming your city in your inquiring email. This Fall, I urge you to organize your fellow 'plotters' to gather up all the leaves they can find and horde them at the garden over winter for mulching and composting come Spring. Perhaps assign spotters to shine The Leaf Signal against moody clouds when they find a neighborhood whose streets are lined with SPBs; then the group can clamber into The Leaf Mobile and rescue those mineral-rich treasures before they fall into the pitiless maw of the trash truck. But for now, stick with the salt hay. First, it is premium material. I generally recommend that people buy bales of straw for compost and mulch if they're out of leaves. I WOULD say salt hay first, butI don't want people getting bummed out when they can't find the stuff. So if you've got a source, buy it! See if your fellow community gardeners want to go in on a big purchase—then maybe you can get a better price on a group delivery! Second, paper is, sadly, problematical. Let's take direct mail (which you probably call junk mail, but I don't because it paid my mortgage them any years I was Editor-in-Chief of dear old ORGANIC GARDENING magazine). There are issues with the inks, with the coatings used to make the slick paper all bright and shiny and slippery, and with the paper itself—which was likely bleached and therefore contains some amount of dioxin. Same with shredded office paper. No two papers are alike, and some are bleached with dioxin-creating chlorine. And while recycled paper is, I believe, a boon to the environment in many ways, it may well have been chemically treated to whiten it as well. Now, if you want to use some shredding to mulch flowers and other strictly ornamental plants, go ahead. Just don't use that ground for edibles. But I would never consider paper for compost making. Forget the possible contaminants; there's no nutrition in shredded paper! Being a tree is so long in their past, its barely a dim bulb memory to those processed sheets. I know that many people compost so that they can avoid tossing their kitchen waste away, but the REAL value to your GARDEN comes from the LEAVES! That kitchen waste is largely just food for the organisms that will breakdown the leaves and release the incredible storehouse of nutrients within. You can compost leaves all by themselves and get an excellent compost. As those of you who've made the mistake know all too well, if you try and compost green waste all by itself you get yucky slimy green waste. Recycle the papers. Mulch with your precious salt hay and be happy you can get it. The rest of you out there, settle for straw if you can't. (Just make sure it's NOT hay; those seed heads will make your garden a weedy mess!) 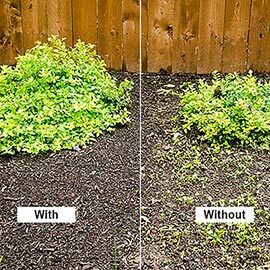 Or, if you know someone with an herbicide-free lawn, collect their dried clippings—they're the #1 Best garden mulch! And if finding leaves for proper compost making seems an endless chore, use a worm bin to change your kitchen trash into garden gold instead. Those little wigglers produce the only fertilizer that's actually BETTER than compost!